My son and new daughter-in-law were married on June 1st of this year (I can’t believe it’s been almost a month ago). Prior to the wedding, I had shopped for a dress. 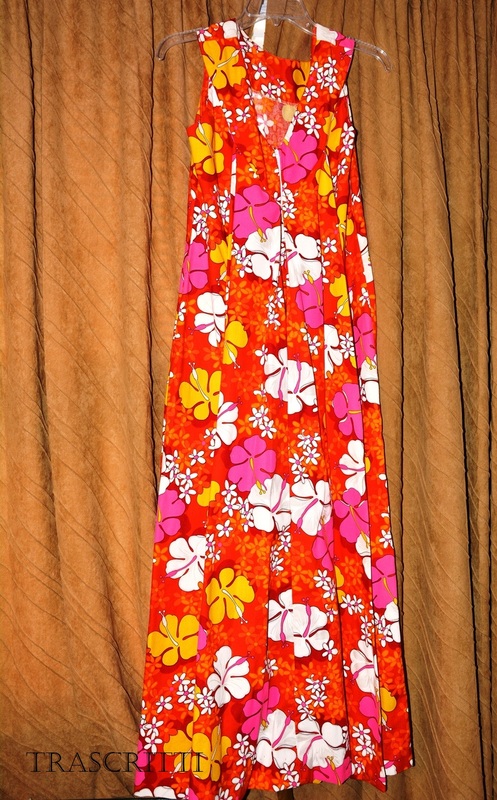 I wanted one that was “tropical” and I found a beautiful vintage, circa 1960’s, Hawaiian dress. I brought it home and tried it on. I noticed that it needed to be adjusted in a few places so I decided to take it to the tailor. He asked me to put it on and as I stood in front of the three-sided mirror, he gathered material around my shoulders then around my arms and pinned them all down. He noted that it looked like a custom-made dress. Then he looked at the waist of the dress. He thought about moving it up or loosening it around the hip area. Then he suggested that the collar get tightened, but in order to do that he would have to unravel some of the design around the neckline. For some reason, the whole incident made me think about Adam and Eve and how they sewed fig leaves together to clothe themselves (Genesis 3:7). I’m sure the leaves didn’t really fit right—it couldn’t cover them the way they wanted. I’m sure they tried to make some adjustments, but there wasn’t much they could do with it; however, God made clothes for them and it fit (Genesis 3:21). I really never found the “perfect” dress for the wedding— I found a dress off the rack in a department store at the mall. I wondered, is there really such a thing as a “perfect” dress here on earth? Revelations 3:4-5 says, “Yet there are some in the church in Sardis who have not soiled their clothes with evil. They will walk with me in white, for they are worthy. All who are victorious will be clothed in white. I will never erase their names from the Book of Life, but I will announce before my Father and his angels that they are mine” (NLT). I think nothing will compare to the “dress” that God will give us one day.